Due to Cantonese emigration, much of the Chinese food available in the west is derived from Cantonese food. Famous Cantonese dishes include char siu pork, which is seasoned with honey, five-spice, red fermented tofu, soy sauce, and hoi sin sauce, then served either inside buns or with rice or noodles; and sweet and sour sauce which is traditionally made from a mixture of vinegar, dried plum, and candied hawthorn berry. Of course, no discussion of Cantonese cuisine would be complete without mentioning dim sum, also called yum cha. Dim sum is a collection of small dishes usually eaten served with endless amounts of tea and eaten as breakfast or brunch. Dim sum dishes include steamed buns, dumplings, chicken feet, spare ribs, and rice steamed in lotus leaves, as well as sweet treats like egg custard tarts and coconut or mango puddings. Sichuan cuisine comes from the southwestern region of Sichuan. It is renowned for its bold and spicy flavors, making use of garlic, chili peppers, and the Sichuan peppercorn, prized for its unique numbing effect. The chili pepper is not native to China, but is believed to have come from Mexico via India! A major ingredient is doubanjiang, a spicy paste made from fermented broad beans, soy, and other spices. Famous Sichuanese dishes include Kung Pao chicken, where stir-fried chicken is served with vegetables, peanuts, and Sichuan peppercorns; and Mapo tofu, served in a chili and fermented black bean sauce with minced meat (usually pork or beef). Sichuan is also famous for hotpot, a style of cooking where ingredients are cooked at a table in a round, heated pot filled with soup stock. Kung Pao chicken was named after Ding Baozhen, a regional governor of Sichuan during the 19th century whose title was gong bao. Because of its connection to the old feudal regime, the dish was considered “politically incorrect” during the Cultural Revolution and was renamed hongbao jiding (fast-fried chicken cubes)! Jiangsu cuisine comes from the Jiangsu Province, a coastal province which is also home to the famous Yangtze River Delta. 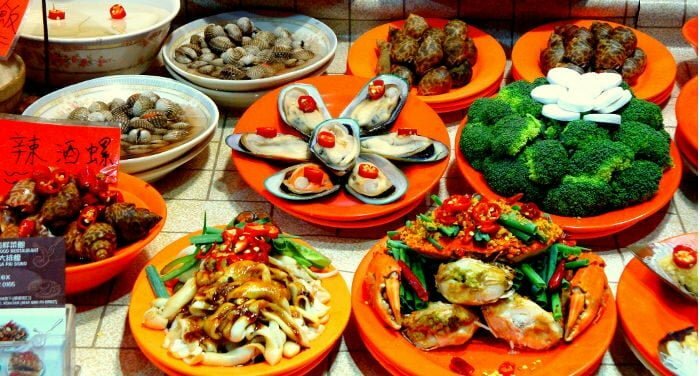 Jiangsu is known as yu mi zhi xiang (“land of fish and rice”): fresh fish and seafood feature heavily, and Jiangsu cuisine prizes meat and fish that melt in the mouth without falling apart. Beloved by officials, Jiangsu cuisine is frequently served at state banquets, and dishes from the city of Huaiyang were served, for instance, at a banquet for U.S. President George W. Bush in 2002. Well-known Jiangsu dishes include Lion’s head meatballs made from braised pork and stewed with vegetables. The city of Nanjing is famous for its dried salted duck, and Yangzhou fried rice is a mixture of fried rice with pork, shrimp, scallions, egg, and vegetables which is also known as house fried rice or special fried rice in western Chinese restaurants. Hunan cuisine is known for its colorful dishes and spicy flavors. While Sichuan cuisine is known as ma la (“numbing and spicy”) for its use of the Sichuan peppercorn, Hunan cuisine is known as gan la (“dry and spicy”) for using only chili peppers. While both cuisines are oily, Hunan cuisine also uses more smoked and cured ingredients than Sichuan cuisine. Famous Hunan dishes include Dong’an chicken, a cold dish of parboiled chicken flavored with chili, rice vinegar, ginger, and scallions; and Chairman Mao’s red-cooked pork, braised in ginger, garlic, spices, chili, soy sauce, and rice wine, and said to be a favorite of Chairman Mao, who came from the Hunan region. Mao himself said “if you do not eat chili peppers, you cannot be a revolutionary”! Zhejiang cuisine is from the coastal province of Zhejiang, and so makes use of fresh fish and seafood. Unlike the cuisine of its northern neighbor Jiangsu, crispness is prized and so many dishes are served raw or nearly-raw, with a refined, light flavor comparable to Japanese food. Renowned Zhejiang dishes include Dongpo pork, which is pork belly stewed in rice wine and soy sauce, and Beggar’s chicken, which is stuffed chicken wrapped in clay and then cooked slowly at a low heat – it can take up to six hours to make! Anhui cuisine comes from the inland province of Anhui and is renowned for its simplicity and its use wild of herbs from the forests and rivers of the region. Light in taste, Anhui dishes will make use of animals caught in the wild such as shrimp, turtles, and frogs, as well as pork and ham. One famous Anhui dish is Yi Pin Guo (“royal pot”), a simmering layered hotpot stew made with a huge variety of ingredients, including dried bamboo shoots, pork balls, tofu, chicken, duck, pig trotters, ham, sea cucumber, and many others depending on the chef’s taste. The American-Chinese dish chop suey (za sui in Chinese) is said to have been created for Li Hongzhang, a famous official from Anhui. The story goes that when Li visited America in 1896, his personal chef tried to make a dish that would be suitable to both American and Chinese palates. But this might well be a myth! Fujian cuisine comes from Fujian Province, a coastal province which is also nearly 63% forests. As a result, it makes use of fish and seafood as well as woodland delicacies such as mushrooms and bamboo shoots. Fujian cuisine emphasizes umami flavor and freshness rather than using spices to mask the taste of ingredients. Many Fujianese emigrated to Malaysia, Singapore, and Taiwan, so there are notable Fujianese influences in the cuisines of those regions. Broths and soups feature so heavily in Fujianese cuisine that there is even a saying: bu tang, bu xing “no soup, no meal”! Famous Fujian dishes include oyster omelette; bak kut teh (“meat bone tea”), pork ribs simmered in a lightly spiced broth; and popiah, a thin crepe-like pancake filled with vegetables, meat, or seafood. Shandong cuisine comes from the northern coastal province of Shandong. It is known for its wide-ranging choices in ingredients such and cooking methods, such as quick-frying, stewing, boiling, and roasting. Uniquely, Shandong cuisine uses maize, which is rarely grown in China. Its temperate climate means that wheat is frequently used in buns and noodles. It is a major influence on cooking for many of the northern regions, including Beijing. A popular dish in western Chinese restaurants, moo shu pork (mu xi rou) is believed to have originated from Shandong – in the local version, it is served with cucumber and wood-ear mushrooms. Dezhou braised chicken is simmered in a spiced broth containing soy sauce, star anise, cinnamon, and dried tangerine. Sweet and sour carp is another famous meal, and for authenticity, the carp should be caught from the Yellow River itself. Another commonly eaten dish is sweet potato in caramelized sugar. Although these are the eight major classic schools of Chinese cuisine, there are many more types of Chinese food to be had. These include Yunnan cuisine from the southwest province of Yunnan, which is widely varied as a result of the many ethnic minorities who live in the area, as well as uniquely making use of goats’ and cows’ milk cheese; Uyghur cuisine, with middle-eastern and central-Asian influenced dishes cooked by the Uyghur people of Xinjiang; and Tibetan cuisine, which relies heavily on yak milk and other hearty ingredients to help Tibetans get the calories they need to survive the harsh Himalayan climate. Chinese Muslims (known as hui) also have a long culinary history, and a number of restaurants serving halal food can be found all across China. They make heavy use of mutton and lamb, but there are interesting differences between north and south Islamic cuisine. In the north, cooking is very heavily influenced by Beijing cuisine. Chinese Muslims eat plenty of beef but rarely eat goose, duck, or seafood, while in the south the reverse is true. Unfamiliar China, started by Daryn and Charlotte Schell in Canada, is a website dedicated to bringing more first-hand, objective information about Chinese food, drink, and culture to the world outside this beautiful country. Some of the most popular sections of the website including Cantonese Dim Sum and Congee, with over 100 recipes in each section, as well as All About China, which introduces multiple aspects of Chinese culture in detail. You can get in touch with Daryn and Charlotte through their website Unfamiliar China.